What’s not to love about a $150 camera? The Sony Cyber-shot DSC-S980 is a bare-bones but well-designed pocket camera that offers some nice-looking specs for the price: a 12-megapixel sensor, a 4x-optical-zoom lens ranging from 33mm to 132mm, digital image stabilization, red-eye reduction, face detection, a 2.7-inch-diagonal LCD screen, and ISO equivalencies up to 3200. Those aren’t groundbreaking specs, but they hit many sweet spots for a sub-$200 camera. Alas, the cost-cutting measures needed to happen somewhere, and in the case of the DSC-S980, the trade-off is lackluster image quality. In our lab jury evaluations, we pitted sample images from the DSC-S980 against those from a slew of other bargain-priced cameras. The samples from the DSC-S980 were noticeably darker and, when the flash was turned on, less evenly lit than those of the competition. Overall, the DSC-S980 earned an imaging score of Fair. Battery life was a much brighter note, however. The DSC-S980 took a whopping 379 shots on a single charge of its lithium ion battery, enough for a battery-life rating of Very Good. 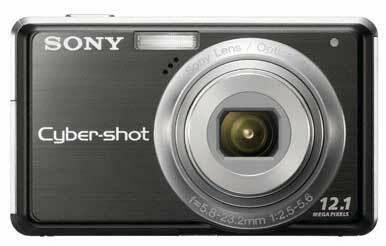 Like the more expensive Sony Cyber-shot DSC-W230 ( ), the DSC-S980 has a host of convenient design elements going for it. Topmost on that list is the mode dial, which provides quick analog access to six shooting modes (Program Auto, Auto Mode, Easy Mode, Auto ISO Mode, Scene Mode, and Movie Mode). In Program Auto mode, with manually adjustable ISO settings, the DSC-S980 performed at a decent level in low-light scenarios. Noise became a bit disruptive at ISO 1600, and was extremely visible at ISO 3200. Even so, the camera snapped bright shots at high-light-sensitivity levels. The DSC-S980 has a 2.7-inch LCD. The DSC-S980 shoots standard-definition, 320-by-240 video at 30 frames per second, saving them as AVI files. As with most basic point-and-shoots, you can’t use the zoom while filming video. As usual with Sony’s point-and-shoot cameras, the on-screen navigation for selecting and adjusting settings is intuitive and well designed; users should have no problem picking the camera up and getting started right away. The button layout is simple, which goes hand-in-hand with the camera’s basic set of features. The power button and shutter button are on the top right of the DSC-S980, while the A/V-out and DC-in ports are on the right side behind a flimsy-feeling plastic and rubber door. On the back of the camera is a zoom rocker, the six-selection mode dial, a menu button for accessing contextual settings, and a four-way directional pad for navigating the on-screen interface. The four main directions on the circular pad also offer one-press access to the LCD screen settings, the flash, the self-timer, and the macro mode. Below that are two more dedicated buttons, to activate playback and delete photos. The battery and Memory Stick slot are tucked under a door on the bottom of the camera. Of course, image quality is very important in a camera, which is why we can’t wholeheartedly recommend the DSC-S980. Nevertheless, it is a nice, cheap option for an aspiring younger photographer, and it has basic, intuitive controls that would be easy for anyone to learn. For almost any other buyer looking for a Sony point-and-shoot, we’d recommend plopping down the extra $50 for the DSC-W230.